Although Rolfing has been around since the 1960s not many people have heard of it. That is slowly starting to change, especially as Olympic athletes and celebrities like Gwyneth Paltrow help spread the word. In the UK there are only 36 Certified Rolfers, so it is a therapy that is still small but growing. What exactly is Rolfing and how does it work? Is it painful? What does it achieve? In this two-part series Angie Macdonald provides an in-depth account of her experience of being Rolfed. When I told a friend that I was having Rolfing sessions she thought it was an abbreviation for “Roll on the floor laughing”. As much fun as that sounds, Rolfing® Structural Integration, to give it it’s proper name, is actually a form of hands-on body work and movement training. It’s called Rolfing after its founder, Dr Ida Rolf, an American biochemist who developed the method in the 1960’s. Rolfing helps to improve posture, reduce aches and pains and give people greater flexibility, more energy and greater ease in their bodies. It’s an effective treatment for chronic muscular-skeletal pain conditions, such as lower back pain, repetitive strain injury, sciatica and stiff and painful shoulders. In other words, perfect for someone like me. How is Rolfing Different to Other Body Treatments? Rolfing can feel similar to a deep tissue massage and a Chiropractic or Osteopathic treatment but there is one major difference. 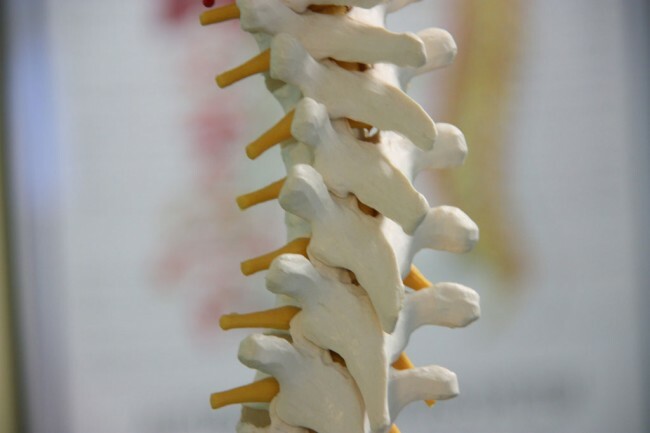 Whereas massage releases muscle tension through pressure, and is not designed to bring about structural change in the body, and Chiropractic and Osteopathy focus on spinal manipulation, bone alignment and joint mobility, Rolfing works on the fascia or connective tissue. The fascia, or connective tissue, is the thin membrane that surrounds individual muscle fibres, nerves and blood vessels, connects muscle to bone and forms tendons and ligaments. It looks a bit like cling-film or that thin, white layer you often see in raw chicken or steak. It prevents friction by allowing the muscles, tendons and so on to glide over each other on movement. Over time poor posture, injury, stress and repetitive movements can cause the fasciae to become tight and pull the muscles out of alignment. This is usually felt in the body as chronic pain, knots, pain, tension or stiffness, with decreased flexibility. One of the remarkable qualities of connective tissue is its plasticity, which is why it is so responsive to Rolfing treatment. I have bad posture. It started when I was a young child suffering from asthma and by the time I was ten years old I had the rounded shoulders of an old woman a few inches short of a dowager’s hump. Later, as a teenager, an X-ray revealed that I had kyphosis which is excessive curvature of the spine in the upper back region. It’s exacerbated by spending long hours sitting in front of a computer and I frequently suffer from back pain, stiff shoulders and neck and tension headaches. I first heard about Rolfing when I was a Drama student at university in South Africa in the ’80s. I had an inspirational movement lecturer, the late Jillian Hurst, who helped me a lot with my posture and co-ordination, and told me that if I ever lived in London I should take the opportunity to be Rolfed. At the time there weren’t any Rolfers in South Africa and it was one of the many things we had to travel ‘overseas’ to experience. Thirty years went by (over twenty of them in London) before the opportunity to be Rolfed presented itself and I felt that the time was right to start the process. At the beginning of 2014 my body was in bad shape and my attempt to be fit and fab by fifty was not going according to plan. Over the course of a few months I had managed to tear the rotator cuff in my right shoulder and injure my lower back at a Pilates class. A trip to South Africa to attend my father’s funeral had left me with sternocostal joint inflammation and a pectoral muscle spasm that would not shift. And, an attempt to get fit by running left me with a tear of my medial gastrocnemius (one of the muscles in my left calf) which took months to heal. I was a walking disaster zone and I knew I had to do something about my body before I got much older and the injuries became more sinister or long-term. It’s not every day I strip down to my underwear in front of a strange man and so it was very important to me that I felt comfortable with my Rolfing practitioner. Rolfing is a very physical and intimate process which involves a lot of trust. As with any form of therapy, you’re in a vulnerable position which is why it’s so important to choose a practitioner that you like and feel comfortable with. Luckily, I felt that immediately upon meeting Lukasz Gregorczyk. A recent graduate of The British Academy of Rolfing Structural Integration (BARSI), Lukasz has a lovely gentle, sincere, intense manner which put me at ease and made it easy to trust him and work with him. 3. A sense of mind/body connection. I’ve always felt like there’s a split between my mind and body and I wanted to feel integrated. One of the things I really like about Rolfing is that it has a structure and is finite. Unlike some forms of therapy which can carry on for years with no end in sight, Rolfing is based on 10 sessions. It’s a clear, defined programme of treatment and obviously within that, there’s space for the Rolfer to adapt the programme to your body and your particular needs in that session. Each Rolfing session has a different theme which focuses on different parts of the body. Starting with breathing, the Rolfing 10 series looks at how your legs and feet support you, opens up the hips, pelvis and chest, and works deeply on the back, shoulders, arms, neck and head, including the jaw and nasal cavity. After you’ve completed the 10 sessions it’s best to take a break for a few months so that the body can continue to change and then decide if you need a few follow-up sessions. The beauty of Rolfing is that as the body becomes re-educated, it releases. Not all of it is a conscious process. Rolfing has a reputation for being excruciating but overall it wasn’t nearly as painful as I expected it to be. Apart from my first Rolfing session, when I felt as if I’d been run over by a double-decker bus afterwards. My entire body ached so much I thought I was coming down with the ‘flu. After 24 hours I felt fine. That was the only time that happened. After all the other sessions I felt fine and alert. That’s not to say it wasn’t very uncomfortable at times but whenever the pressure of touch felt too much I told Lukasz and he adjusted it accordingly. Occasionally I would experience a bit of burning and slight muscle ache afterwards in the areas of my body that had been worked on that day but the symptoms would always disappear after a good night’s sleep. Another physical symptom was extreme thirst after each session. It’s important to drink a lot of water afterwards in order to rehydrate. I also slept extremely well which was wonderful. A typical Rolfing session lasts about 1.5 hours and begins with a chat about how you are and any feedback since your last treatment. At the beginning of the process Lukasz took a series of photographs of my posture from different angles so that we would be able to compare how I was before and after the treatment. Each session begins and ends with a ‘body reading’. Lukasz studies my body and posture from all angles and watches closely as I walk back and forth across the room. He explains his observations very clearly. Usually at the mid-way point in the session, and/or again at the end, we repeat this process so that I can give feedback on how my body is feeling, any areas of pain, any sensations I’m noticing. Often, the contrast between the left and right sides of my body is quite remarkable with the side that’s been worked on feeling warmer, more relaxed, lighter, and even lower (in the case of my shoulders). After both sides have been worked on I feel more integrated. This monitoring of how my body is feeling and changing leads to greater physical awareness as I move from a state of imbalance to balance. At the end of each session, I felt a lot calmer. Stretched, less stiff and a lot more relaxed. NEXT: In I’ve Been Rolfed – Part 2: How Rolfing Changed My Life I look more closely at how my body changed and my physical awareness grew over the course of the treatment and what I ultimately gained from being Rolfed. Read more about my attempts to be Fit and Fab by Fifty. Nice article Angie! I’m a Rolfer™ and when I visited the UK in 1997 or so, very few people knew about Rolfing® SI and there were even fewer Rolfers than now. I’m glad it’s coming along and that it helped you! Hi Anne. Thanks for stopping by. Yes, it’s great that Rolfing is finally getting the recognition it deserves. The more people who benefit from it, the better!